For a truly memorable experience during your vacation in Punta Cana, give our Dolphin Swim Adventure program a try! You'll get to hug and pet our friendly dolphins and even interact with them for a Boogie Push and belly ride! Get ready to make memories that will last forever. If you want a vacation activity that you will always remember, join us at Dolphin Discovery Punta Cana for our Dolphin Swim Adventure program. This life-changing experience will make you laugh and cheer as you watch our charming dolphins put on an acrobatics show for you. After a short briefing from our trainers about the dolphins, you can hop into the water to kiss, hug, play, and shake hands with these friendly marine mammals. You'll also get to experience two exciting interactions with our dolphins that will put a smile on your face. 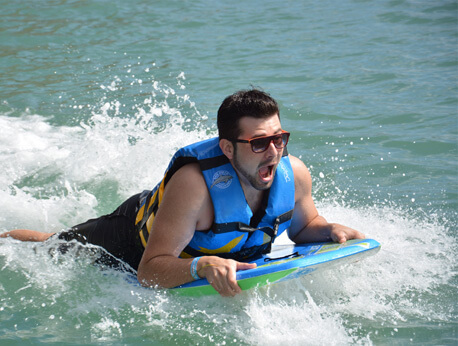 The Boogie Push will thrill you as a dolphin pushes you across the water while you lay on a boogie board. You'll also take a Belly Ride as you hold onto a dolphin's fins and lay flat on their underbelly while swimming backwards through the water. You have never participated in an experience like this one! This exhilarating program costs just $149 for adults (guests taller than 4'7") and $99 for kids (guests between 3'11" and 4'7"). These prices include a 10-minute program briefing with our trainers, 50-minutes of swim play with the dolphins, and transportation to Dolphin Discovery Punta Cana from your hotel if arrangements are made 24-hours in advance of your reservation. Please arrive at least 30-minutes ahead of your reservation time in order to ensure you are present for your important informational briefing. The safety of our guests and animals is always at the forefront of any activity we offer here at Dolphin Discovery. Because of this, we’ve implemented several policies to ensure the safety of all participants. Due to the active nature of this experience, we ask that pregnant women more than 5 months along do not participate in our Dolphin Swim Adventure program If you are less than 5 months pregnant, you may enjoy the activity with another paying adult after filling out a responsibility form. We also request that all 6 to 12 year olds be accompanied by an adult who has also paid for admission. Please wear biodegradable sunscreen in order to protect the safety and well-being of yourself, our dolphin friends, and the environment. We have just four reservation times per day, so book now for the experience of a lifetime!